The Culinary Cruise along the Lower Mississippi River cruise is perfect for food lovers who relish the blend of American, French and deep South influences on dishes native to the region. 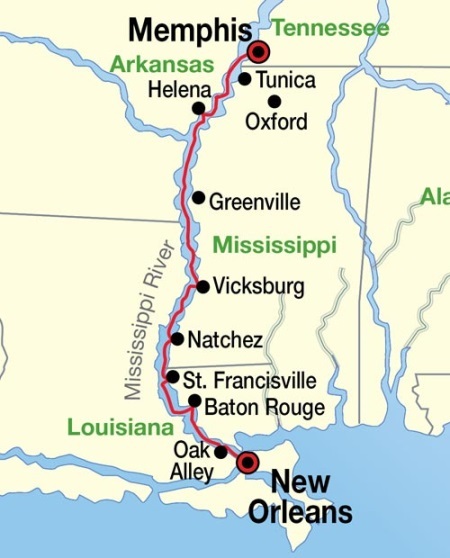 This 8-day cruise travels from Memphis, long renowned for having some of the best BBQ in the States, to New Orleans, one of the country's most famous culinary capitals. During the cruise, you will see cooking demonstrations, learn new recipes, and get a behind-the-scenes tour of the Louisiana Culinary Institute. Enjoy savory regional dishes including Chicken Gumbo, BBQ Shrimp, Louisiana Jumbo Lump Crab Cakes, and Bourbon Pecan Pie.